Since my last Book Bag instalment I have been reading the books that Rob gave me for Christmas. They include a book on science for Children and two comics of Fairy Tale characters that are for adults. My husband knows me well! 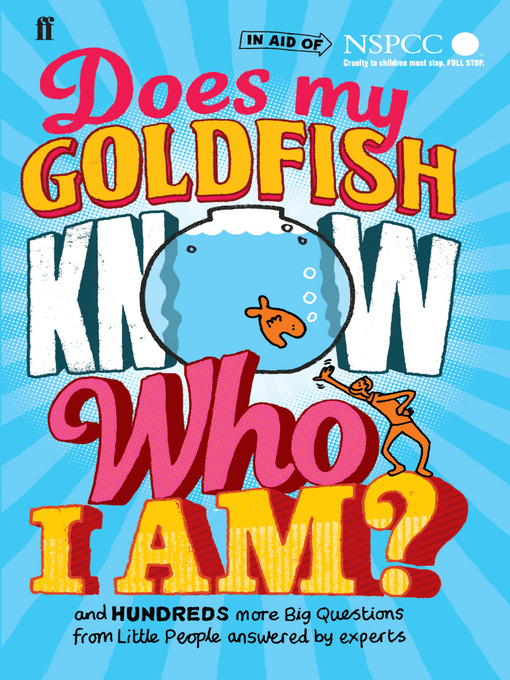 Does my Goldfish Know Who I am? ‘Children ask the funniest questions: Why does sweetcorn come out the same as when I ate it? Do spiders speak? Why does Daddy never win the lottery? Which is faster, a Velociraptor or a cheetah? How does the lady in the satnav know where to go? Does my goldfish know who I am? This book takes real children’s questions gathered from primary schools across the UK and asks some of the greatest thinkers and experts of our time to give short and accessible answers. Brian Cox explores the edge of the universe, Sir David Attenborough tells us whether monkeys could ever turn into men, and Miranda Hart ponders why it’s funny when someone farts. Other contributors include Bear Grylls, Sir Paul McCartney, Kate Humble, Sir Quentin Blake, Bettany Hughes, Heston Blumenthal, Alice Roberts, John Lanchester, A. C. Grayling, Annabel Karmel, Jeremy Paxman, Dan Snow, Jojo Moyes, Madhur Jaffrey and Tony Robinson. I used to love science at school and was rather good at it. But since the need to pass GCSEs has long passed, my mind has become a bit fuzzy on amazing things I once knew pretty well. So it was a real treat to get a refresher on lots of interesting topics in this book. Each section starts with a brilliant question from a youngster and then a different expert gives an answer in a way that is simple enough to understand but not so basic that adults won’t learn something too. One of my favourite things in the world is to listen to clever people who are passionate about what they do. I find that even if it is a topic that would never interest me normally, an enthusiastic expert can still draw me in if they explain why such a subject if fascinating to them. As each section is only a page or two long this was a really easy book to dip in and out of. My favourite segments were Miranda Hart talking about why farts are funny and learning about a spider who went to space and adapted her hunting tactics for zero gravity conditions. I’ll write about these together as I read them very quickly one after the other. Fables is my comic series of choice. It took me a while to enjoy reading comics – at first I kept forgetting to take in the pictures, I just read the words and moved on – kind of missing the point of that style of story-telling. But then Rob introduced me to the Fables series and it all clicked into place. Now whenever we head to a city that holds a Forbidden Planet I get to go and pick up the next instalment. There is over a 100 in the series so this is going to take me a while! 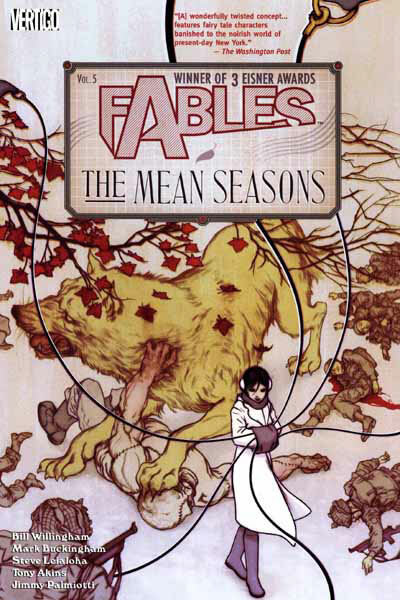 Fables follows the adventures of all of our favourite fairy tale and legendary characters. Centuries ago they were driven from their homelands by the ‘Adversary’. They fled in to our world and set up a secret community in New York. The comics follow the Fable’s modern day struggles, crimes and romances as well as flash backs to their former exploits in the homelands. These last two volumes saw Fabletown come under attack by an army of Wooden Soldiers sent from the Adversary seemingly to test their defences. In the Mean Seasons there is a mysterious murder spree, a change in Government and Snow White has a litter of babies to Bigby with some wolfish characteristics. The more I read the Fables series the more I enjoy it. Characters are getting more and more complex with each addition. Bigby the Wolf is especially fascinating. He is a mixture of 1930 noir detective and a really angry Wolverine. Prince Charming too is growing on me as the stories unfold. In the first instalment he appeared nothing more than a scrounging love rat, but since then he has disposed of the Vile Bluebeard, led the front lines to defend Fabletown and is now a Mayor who has discovered there is no way to keep his election promises. The action and adventures are fantastic but it is this continual adding of layers to the characters that makes Fables a series I look forward to coming back to.